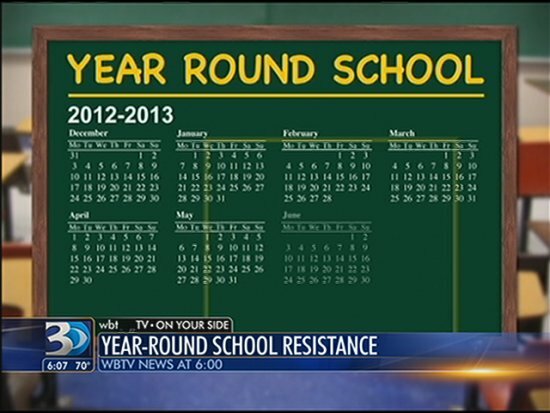 Despite initial resistance, year-round schooling is a beneficial schedule. As the summer break ends, students groan under the realization that school is just around the corner. By this point, many students are bored, having beaten all the video games they own and gone to the pool far too many times for it to be fun anymore. In addition, students often find it difficult to retain information during the long summer break. Then, a two month vacationless span of school ensues in which students become zombies trudging to their next class. Year-round schooling is an idea that could solve these issues. Many people maintain a very flawed perception of what year-round schooling actually constitutes. In truth, the phrase ‘year-round schools’ is a misnomer. Instead of school every day of the year, summer break is a couple of weeks shorter, and breaks through the school year are longer and more frequent. The generally supported plans involve a six week break with a 60-20 or 45-15 ratio of school days to break days not including weekends. The school year would still take 180 days, with potentially beneficial academic returns. Studies conducted by the professors of the subject have shown specific evidence that both economically disadvantaged students and higher income students make very similar gains in the school year, but in the summer, while higher income students make gains, disadvantaged student results deteriorate. These surprising results may go to show that the achievement gap increases not throughout the school year but in the summer. Math and language classes often have to factor in a month or more of review to simply recapitulate what the student has previously learned. While economically advantaged students spend much of their time at educational camps, students with a lower socioeconomic status tend to not take part in academic opportunities. Although not proven, year-round schools could be a fairly easy way to resolve these problems prevalent in our community. Imagine after six weeks of hard work, having a two week break during which you could relax and catch up on much needed sleep. Presently, the longest break outside of summer is the two break over winter break. Summer does not need to be as long as it is currently, and students could use more longer and more frequent breaks. Year-round school is a solution that could lower the achievement gap and could make school more efficient and interesting.